There’s nothing like the Kentucky Derby. The excitement of those 2 minutes is unparalleled. Being there in person is something I’ve gotten to enjoy three times. My grandfather was from Louisville and every time I hear “My Old Kentucky Home” played, I get misty-eyed, as he did. We won’t be at the Derby this year, but we will be at home cheering on my husband’s aunt’s horse. She bred Upstart in Bedford, NY and after decades of breeding thoroughbreds, this will be her first Derby contender. Besides a Mint Julep (or two) the thing I look forward to the most Derby Day is the pie. 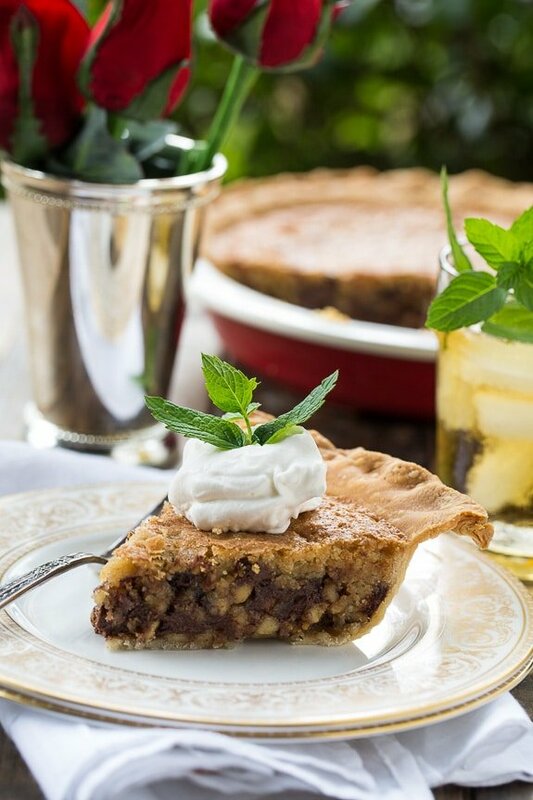 Kentucky Derby Pie is like a pecan pie, only with walnuts and chocolate, and usually a splash of Kentucky bourbon. And it is so good! 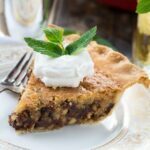 This Kentucky Chocolate Walnut Derby Pie is super easy to make and if using a pre-made crust, it only takes minutes to prepare and about 40 minutes in the oven. The hardest part is waiting for it to cool enough before you slice it so that the pieces hold their form. 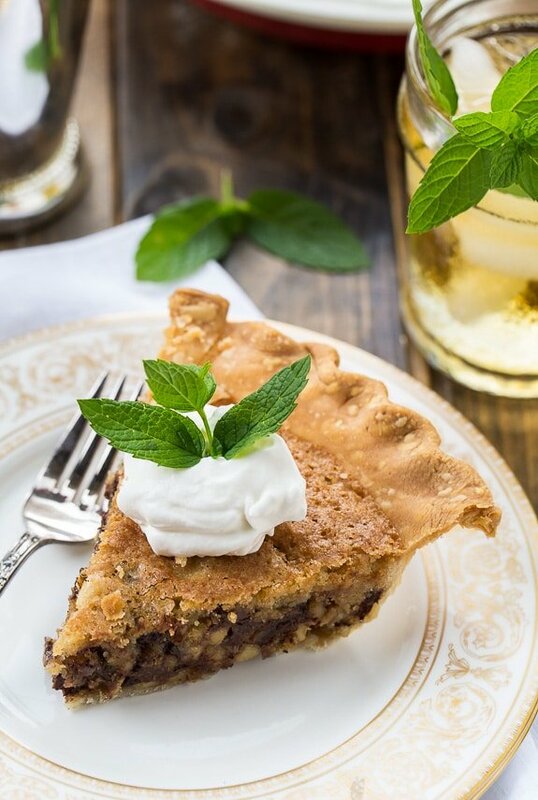 You can serve Kentucky Derby Pie with a big scoop of vanilla ice cream (or try mint chocolate chip) or some Bourbon Whipped Cream. The best part of this Kentucky Chocolate Walnut Derby Pie is the Diamond Walnuts. 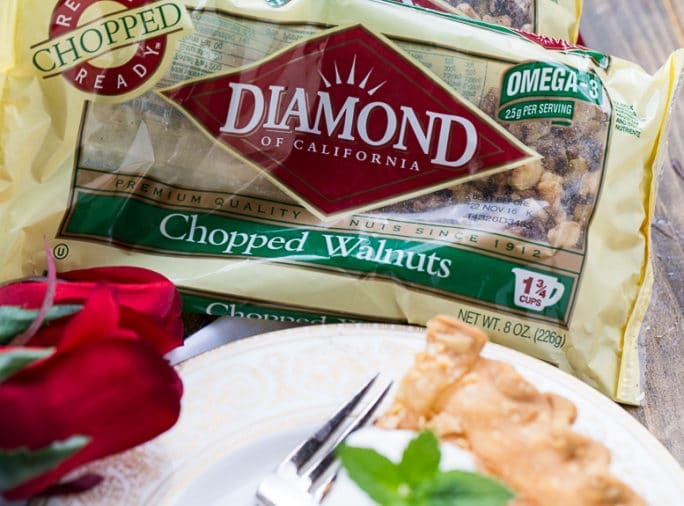 Diamond Walnuts are high quality, fresh tasting nuts that are grown on family farms throughout the state of California. I use them for all kinds of baking, plus I frequently sprinkle them on my salads. I love that the Diamond Chopped Walnuts already come chopped in the perfect size for this Derby Pie. 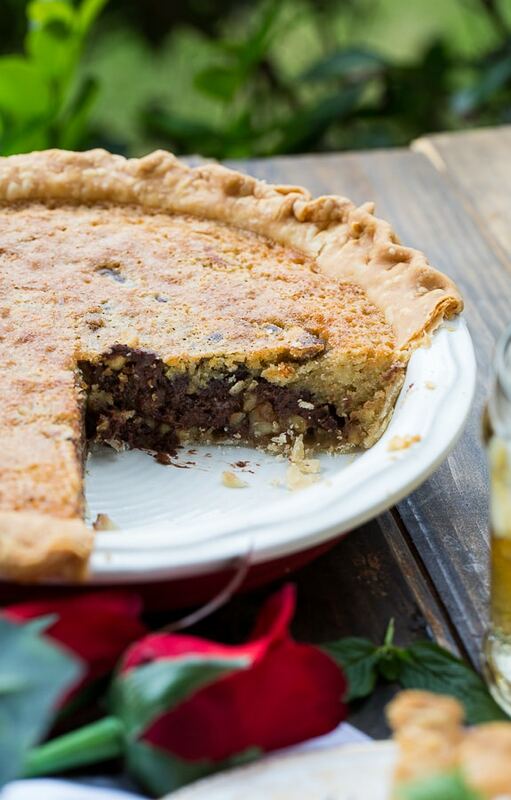 This thick, gooey, chocolaty pie with the delicious taste and crunch of walnuts all in a buttery pie crust is the perfect addition to your Kentucky Derby Day! You can use a refrigerated pie crust or make a homemade flaky pie crust. This gooey homemade pie is full of chocolate chips and walnuts and only takes a few minutes of prep time. Serve with bourbon whipped cream for a Derby Day treat. Preheat oven to 350 degrees. Shape pie crust into a 9-inch pie plate and crimp the edges. 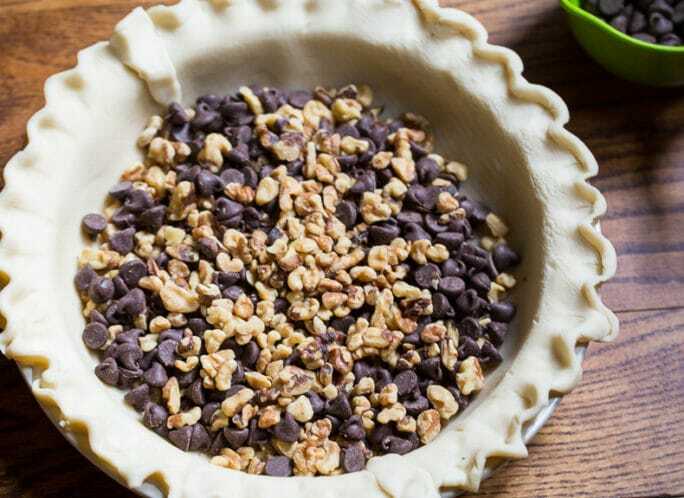 Scatter the walnuts and chocolate chips on top of pie crust. In a medium bowl, whisk together both sugars and flour. Add eggs, melted butter, bourbon, vanilla, and salt and stir until smooth. Pour on top of chocolate chips and walnuts. Place in oven for 40 to 45 minutes, until set. To make bourbon whipped cream, beat heavy cream with an electric mixer until it starts to thicken, add confectioners' sugar and bourbon and continue to beat until the consistency of whipped cream. Let pie cool to room temperature if you want pretty slices. If you want it served warm, you can reheat the slices in the microwave briefly. 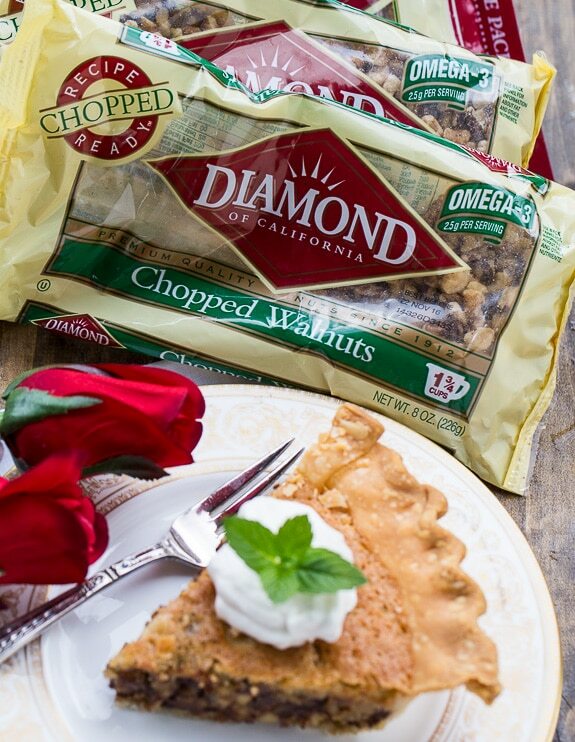 Diamond Nuts is generously giving 5 winners 2 bags of chopped walnuts so that you can make your own Derby Pie. To enter just comment below telling us your favorite way to enjoy walnuts. Winners will be selected at random using Random.org. Giveaway is open until Monday April 27 at 9am EST. Winners will be notified by email and will have 24 hours to respond. If no response within 24 hours, another winner will be chosen. Must live within continental US to enter. Disclosure: This post and Giveaway have been sponsored by Diamond Walnuts. All opinions stated are my own. This entry was posted in Desserts, Pies and Tarts and tagged chocolate, Kentucky Derby, pie, sponsored, walnuts. Bookmark the permalink. Made this with a bourbon twist for dinner guests. Never roasted walnuts before; they became very bitter. Perhaps I over toasted them, or they were freezer burnt. I dunno. Otherwise, it was a big hit! Could this be made with mini chocolate chips? This recipe looks fantastic! Thanks so much for sharing it Christin! My only question is, do you toast the diamond walnuts before you add them to the pie, or do you just use them straight from the bag? Thanks!! Looking forward to making this! There’s no need to toast them first Kaylee. My favorite way to eat walnuts is to spread them out on my cookie sheet and toast them in a 300 degree oven for about 8 to 10 minutes, let them cool and then put them in a air tight jar ( like a Mason jar ) and munch on them , put them on my cereal, ice cream , salads, and many other uses. It’s great, because you don’t have to stop to toast them. Love, love toasted walnuts. Everyone loves it when I add walnuts to my chocolate chip cookies! 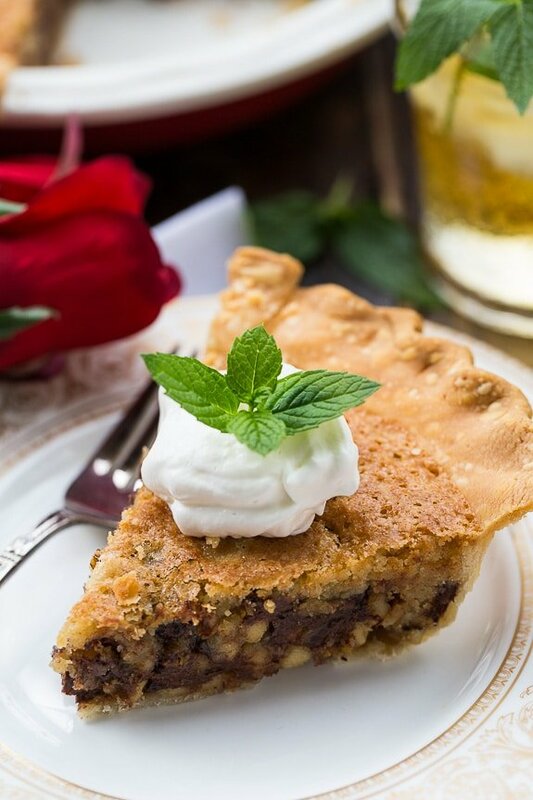 I first had the Kentucky Derby Pie in 1980, in Chattanooga Tn, served warm with Vanilla Ice Cream. I was in heaven. So warm and gooey melted chocolate. I have made it several times over the years. So easy to make. You should try it. Love walnuts out of the bag and in my brownies! I love chopping walnuts very finely and putting them in chocolate chip cookies. Hope you got my email yesterday! Thank you. I like walnuts in baklava! I love walnuts, especially in chocolate walnut fudge. My mouth is watering – this pie looks amazing! I’ve never heard of walnut pie before – thanks for introducing me to it! Holy yum, this looks good!! And I love the idea of bourbon whipped cream.. my bourbon-loving hubby would definitely dig that! I have a super simple recipe to make candied walnuts and they’re my moms favorite. I make a big batch and send her some since she lives across the country. It’s a recipe she taught me to make so I love that I can make it for her now. And second favorite is cranberry, walnut, oatmeal cookies. I love adding walnuts, apple slices and blue cheese crumbles when making a salad. I LOOOOOVE adding walnuts to spinach salads, especially with some strawberries or blueberries too. A chocolate walnut pie, however, sounds phenomenal. I love to use walnuts in fudge and brownies. Marvelous pie for a marvelous event. I love Diamond Walnuts. I use them constantly—cookies & in my oatmeal just about daily. I’ve never had a walnut chocolate pie before, but I love pecan pies and I’m guessing this one is ten times better! I used to live in the south and I’m missing it right now! My favorite way to eat walnuts is to add them to brownies or chocolate chip cookies! Yum! Not the same without walnuts! This looks so good!! I love using walnuts in carrot cake! My favorite way to enjoy walnuts is in brownies. I like Walnuts in Maple Fudge. I’ve never had this kind of pie before, but it looks absolutely incredible! Chocolate and walnuts are a great combination too! I love walnuts on yogurt and oatmeal. Hard to keep an unopened bag of Diamond nuts in our house! Love eating walnuts straight out of the bag! I frequently add walnuts to our daily salad, sometimes add toasted, sugared walnuts to homemade ice cream, but the way I love them most is in my homemade baklava! Living in Ocala, Florida, where so many Derby horses are born, raised, and trained, we are huge Derby fans! Walnuts are an important part of our diet because of the great taste, but also for the health benefits! I’ve never tried a walnut pie.. but it looks pretty delicious! We love it on salads but I’m going to bookmark this recipe for May! I love Derby Pie! The pie with the most lawsuits attached to it (really!). I love it. One of my favorite decadent desserts. I know! I love that the Washington Post published at “Not Derby Pie” . Oh.. this looks amazing, love chocolate walnut combination, one of the combinations I love most since childhood 🙂 Should definitely give this recipe a try. I’ve never been to the Kentucky derby, but it sounds really exciting! I love the combination of chocolate and walnuts in this pie! The bourbon whipped cream sounds like the perfect complement! How cool! Good luck to your husband’s aunt!! That’s so fun! And this pie looks absolutely delicious – so gooey and chocolatey!! This is seriously one absolutely beautiful pie! I made a pie similar to this (no alcohol) only it was called Chocolate Chip Pie and it was so good! 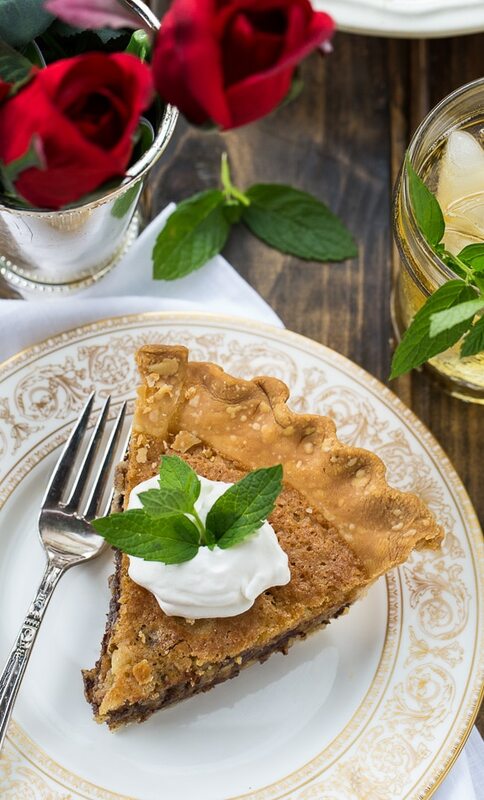 This Derby Pie with bourbon could only be better! I love the spiked whipped cream too! This pie looks fantastic, Christin! I don’t actually watch much of the Kentucky Derby, but I totally would just for this pie. Love it!